Its that time again! If you're in need of a few new pairs of flip flops, you won't want to miss this one day wonder sale at Old Navy. 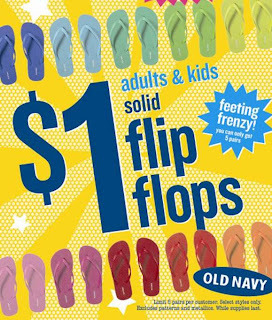 Mark your calendar for this Saturday June 29th.Stop by your local Old Navy and pick up $1 Flip Flops. Woo-hoo! Please note that you're limited to 5 pairs per person. In addition, expect a crowd!!! !